Gravitational-wave astronomy lets us observing binary black holes. These systems, being made up of two black holes, are pretty difficult to study by any other means. It has long been argued that with this new information we can unravel the mysteries of stellar evolution. Just as a palaeontologist can discover how long-dead animals lived from their bones, we can discover how massive stars lived by studying their black hole remnants. 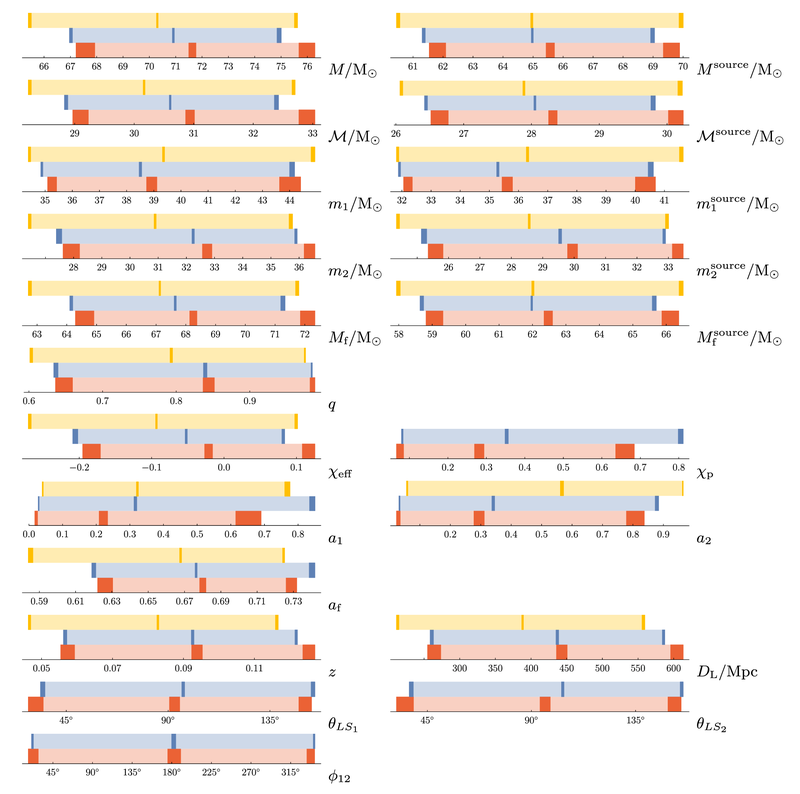 In this paper, we quantify how much we can really learn from this black hole palaeontology—after 1000 detections, we should pin down some of the most uncertain parameters in binary evolution to a few percent precision. There are many proposed ways of making a binary black hole. The current leading contender is isolated binary evolution: start with a binary star system (most stars are in binaries or higher multiples, our lonesome Sun is a little unusual), and let the stars evolve together. Only a fraction will end with black holes close enough to merge within the age of the Universe, but these would be the sources of the signals we see with LIGO and Virgo. We consider this isolated binary scenario in this work [bonus note]. Black hole natal kicks—the push black holes receive when they are born in supernova explosions. We now the neutron stars get kicks, but we’re less certain for black holes [bonus note]. Common envelope efficiency—one of the most intricate bits of physics about binaries is how mass is transferred between stars. As they start exhausting their nuclear fuel they puff up, so material from the outer envelope of one star may be stripped onto the other. In the most extreme cases, a common envelope may form, where so much mass is piled onto the companion, that both stars live in a single fluffy envelope. Orbiting inside the envelope helps drag the two stars closer together, bringing them closer to merging. The efficiency determines how quickly the envelope becomes unbound, ending this phase. Mass loss rates during the Wolf–Rayet (not to be confused with Wolf 359) and luminous blue variable phases–stars lose mass through out their lives, but we’re not sure how much. For stars like our Sun, mass loss is low, there is enough to gives us the aurora, but it doesn’t affect the Sun much. For bigger and hotter stars, mass loss can be significant. We consider two evolutionary phases of massive stars where mass loss is high, and currently poorly known. Mass could be lost in clumps, rather than a smooth stream, making it difficult to measure or simulate. We use parameters describing potential variations in these properties are ingredients to the COMPAS population synthesis code. This rapidly (albeit approximately) evolves a population of stellar binaries to calculate which will produce merging binary black holes. The question is now which parameters affect our gravitational-wave measurements, and how accurately we can measure those which do? 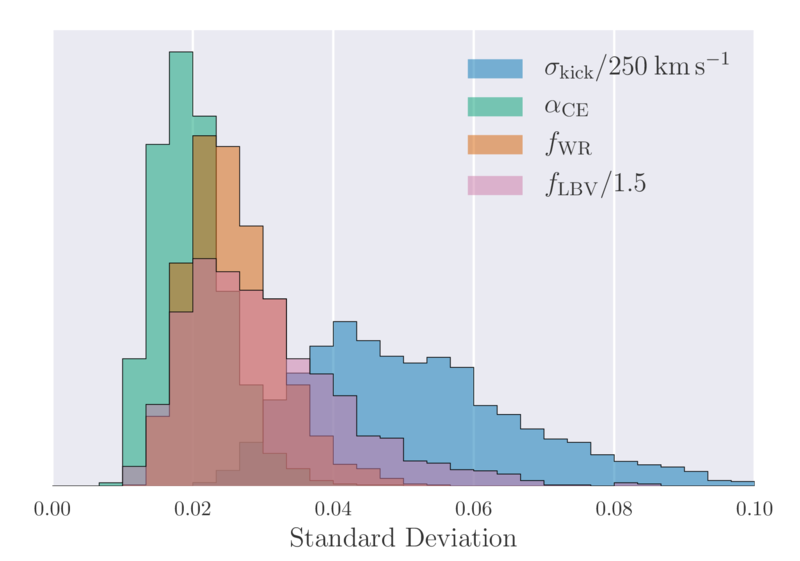 For our deductions, we use two pieces of information we will get from LIGO and Virgo observations: the total number of detections, and the distributions of chirp masses. The chirp mass is a combination of the two black hole masses that is often well measured—it is the most important quantity for controlling the inspiral, so it is well measured for low mass binaries which have a long inspiral, but is less well measured for higher mass systems. In reality we’ll have much more information, so these results should be the minimum we can actually do. 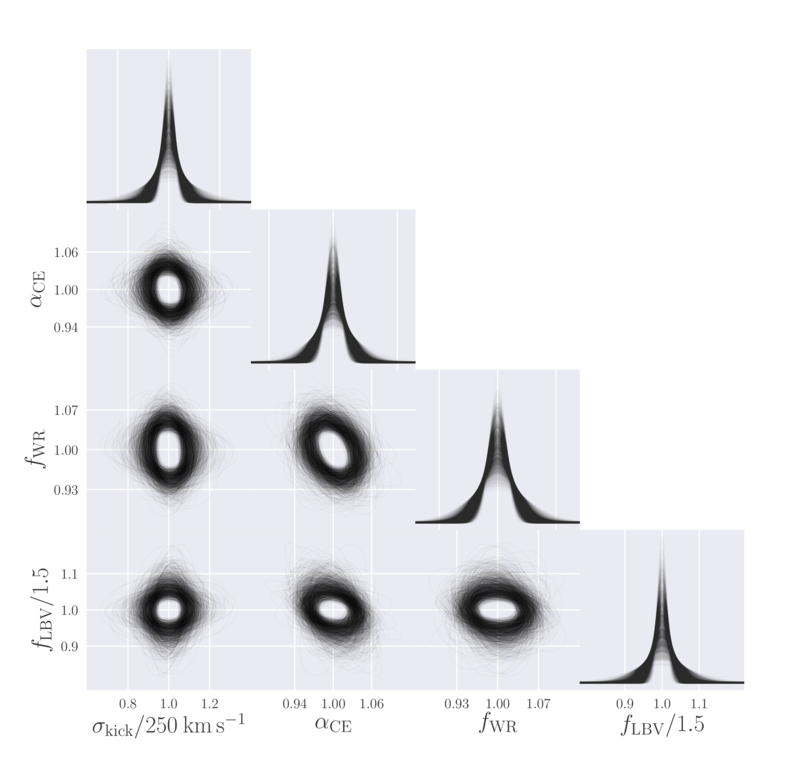 For a set of population parameters (black hole natal kick, common envelope efficiency, luminous blue variable mass loss and Wolf–Rayet mass loss), COMPAS predicts the number of detections and the fraction of detections as a function of chirp mass. Using these, we can work out the probability of getting the observed number of detections and fraction of detections within different chirp mass ranges. This is the likelihood function: if a given model is correct we are more likely to get results similar to its predictions than further away, although we expect their to be some scatter. If you like equations, the from of our likelihood is explained in this bonus note. If you don’t like equations, there’s one lurking in the paragraph below. Just remember, that it can’t see you if you don’t move. It’s OK to skip the equation. where is the likelihood for data (the number of observations and their chirp mass distribution in our case), are our parameters (natal kick, etc. ), and the angular brackets indicate the average over the population parameters. In statistics terminology, this is the variance of the score, which I think sounds cool. The Fisher information matrix nicely quantifies how much information we can lean about the parameters, including the correlations between them (so we can explore degeneracies). The inverse of the Fisher information matrix gives a lower bound on the covariance matrix (the multidemensional generalisation of the variance in a normal distribution) for the parameters . In the limit of a large number of detections, we can use the Fisher information matrix to estimate the accuracy to which we measure the parameters [bonus note]. 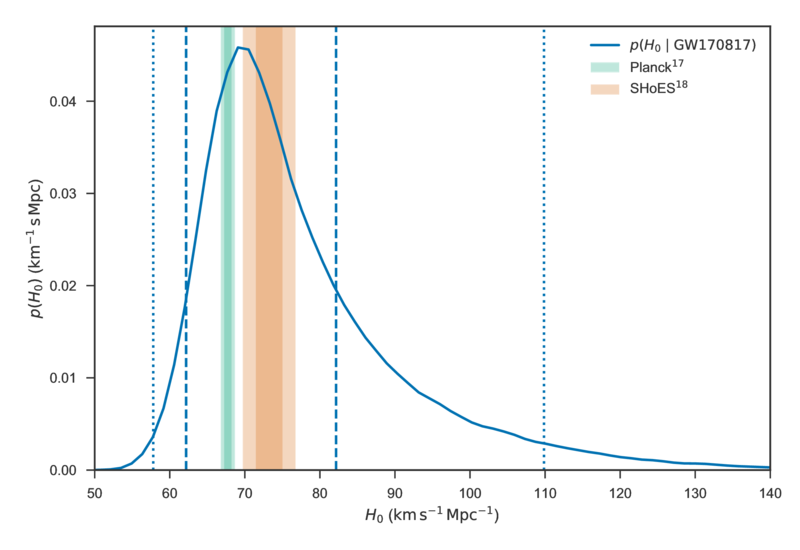 We simulated several populations of binary black hole signals, and then calculate measurement uncertainties for our four population uncertainties to see what we could learn from these measurements. 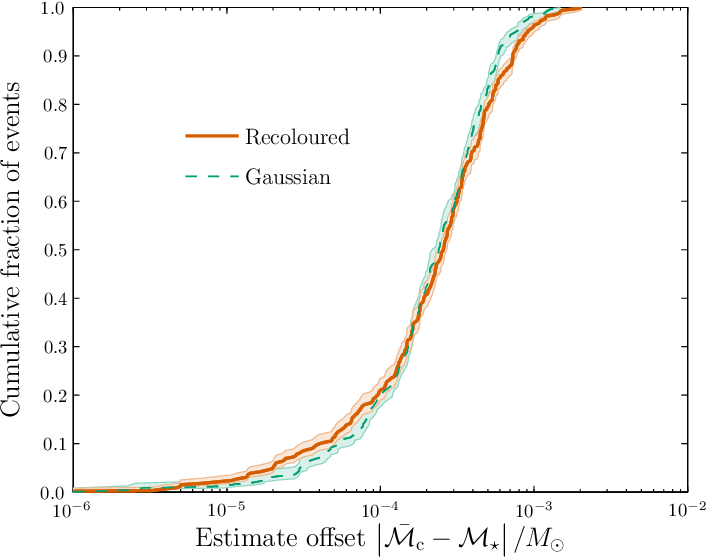 Using just the rate information, we find that we can constrain a combination of the common envelope efficiency and the Wolf–Rayet mass loss rate. Increasing the common envelope efficiency ends the common envelope phase earlier, leaving the binary further apart. Wider binaries take longer to merge, so this reduces the merger rate. Similarly, increasing the Wolf–Rayet mass loss rate leads to wider binaries and smaller black holes, which take longer to merge through gravitational-wave emission. Since the two parameters have similar effects, they are anticorrelated. We can increase one and still get the same number of detections if we decrease the other. There’s a hint of a similar correlation between the common envelope efficiency and the luminous blue variable mass loss rate too, but it’s not quite significant enough for us to be certain it’s there. Adding in the chirp mass distribution gives us more information, and improves our measurement accuracies. 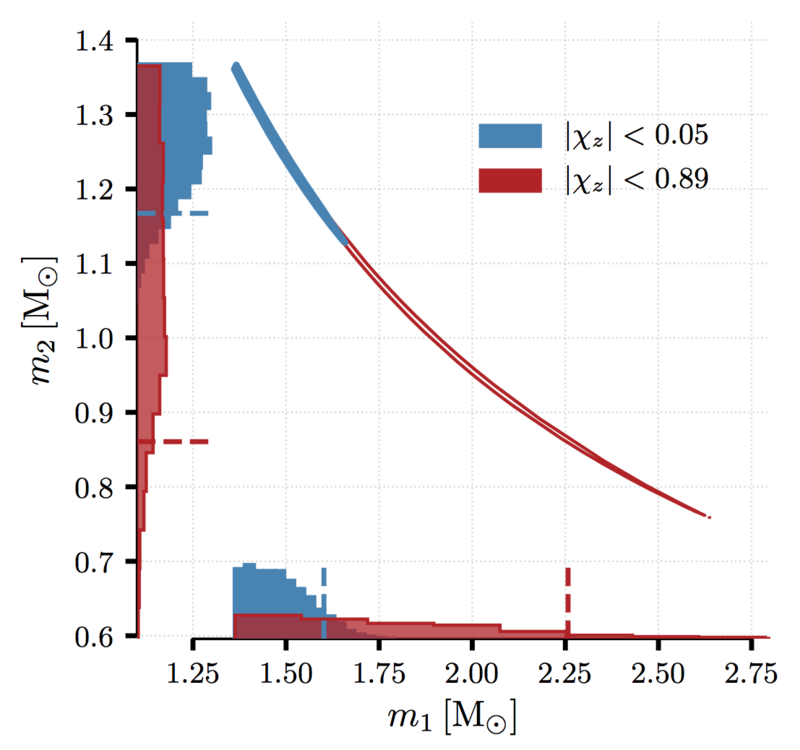 The fraction uncertainties are about 2% for the two mass loss rates and the common envelope efficiency, and about 5% for the black hole natal kick. We’re less sensitive to the natal kick because the most massive black holes don’t receive a kick, and so are unaffected by the kick distribution [bonus note]. In any case, these measurements are exciting! With this type of precision, we’ll really be able to learn something about the details of binary evolution. The accuracy of our measurements will improve (on average) with the square root of the number of gravitational-wave detections. So we can expect 1% measurements after about 4000 observations. However, we might be able to get even more improvement by combining constraints from other types of observation. Combining different types of observation can help break degeneracies. I’m looking forward to building a concordance model of binary evolution, and figuring out exactly how massive stars live their lives. In practise, we will need to worry about how binary black holes are formed, via isolated evolution or otherwise, before inferring the parameters describing binary evolution. This makes the problem more complicated. Some parameters, like mass loss rates or black hole natal kicks, might be common across multiple channels, while others are not. There are a number of ways we might be able to tell different formation mechanisms apart, such as by using spin measurements. where is the fraction that falls back, taken from Fryer et al. (2012). The fraction is greater for larger black holes, so the biggest black holes get no kicks. This means that the largest black holes are unaffected by the value of . In this analysis, we have two pieces of information: the number of detections, and the chirp masses of the detections. The first is easy to summarise with a single number. The second is more complicated, and we consider the fraction of events within different chirp mass bins. These look a little messy, but they simplify when you take the logarithm, as we need to do for the Fisher information matrix. Conveniently, although we only need to evaluate first-order derivatives, even though the Fisher information matrix is defined in terms of second derivatives. The expected number of events is . Therefore, we can see that the measurement uncertainty defined by the inverse of the Fisher information matrix, scales on average as . For anyone worrying about using the likelihood rather than the posterior for these estimates, the high number of detections [bonus note] should mean that the information we’ve gained from the data overwhelms our prior, meaning that the shape of the posterior is dictated by the shape of the likelihood. As an alternative way of looking at the Fisher information matrix, we can consider the shape of the likelihood close to its peak. Around the maximum likelihood point, the first-order derivatives of the likelihood with respect to the population parameters is zero (otherwise it wouldn’t be the maximum). The maximum likelihood values of and are the same as their expectation values. The second-order derivatives are given by the expression we have worked out for the Fisher information matrix. Therefore, in the region around the maximum likelihood point, the Fisher information matrix encodes all the relevant information about the shape of the likelihood. So long as we are working close to the maximum likelihood point, we can approximate the distribution as a multidimensional normal distribution with its covariance matrix determined by the inverse of the Fisher information matrix. Our results for the measurement uncertainties are made subject to this approximation (which we did check was OK). Approximating the likelihood this way should be safe in the limit of large . As we get more detections, statistical uncertainties should reduce, with the peak of the distribution homing in on the maximum likelihood value, and its width narrowing. If you take the limit of , you’ll see that the distribution basically becomes a delta function at the maximum likelihood values. To check that our was large enough, we verified that higher-order derivatives were still small. 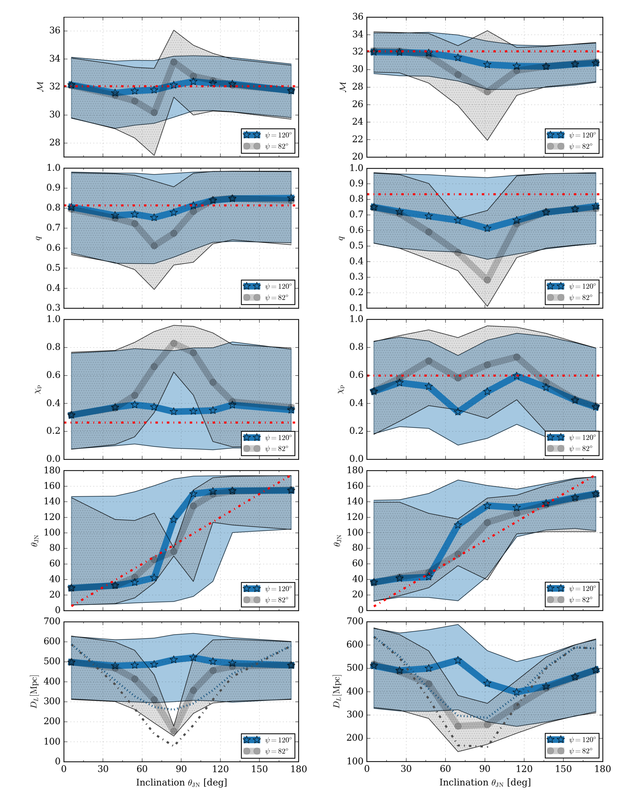 Michele Vallisneri has a good paper looking at using the Fisher information matrix for gravitational wave parameter estimation (rather than our problem of binary population synthesis). There is a good discussion of its range of validity. The high signal-to-noise ratio limit for gravitational wave signals corresponds to our high number of detections limit. 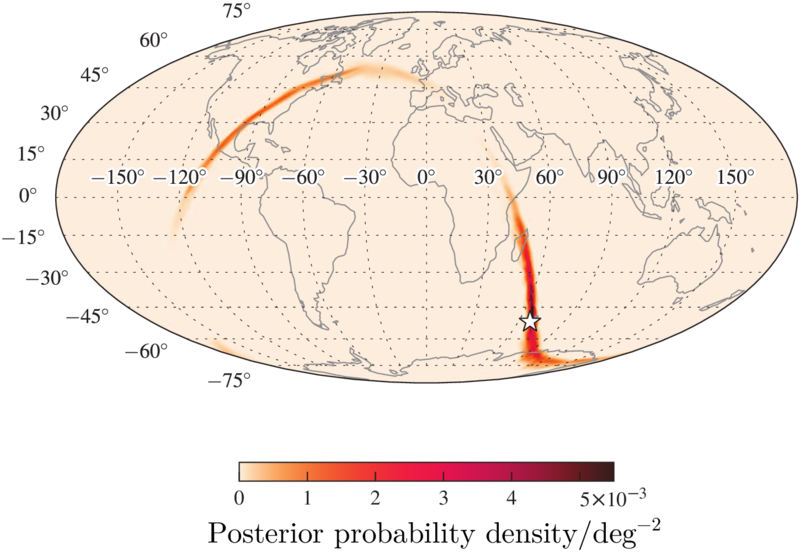 GW150914, The Event to its friends, was our first direct observation of gravitational waves. 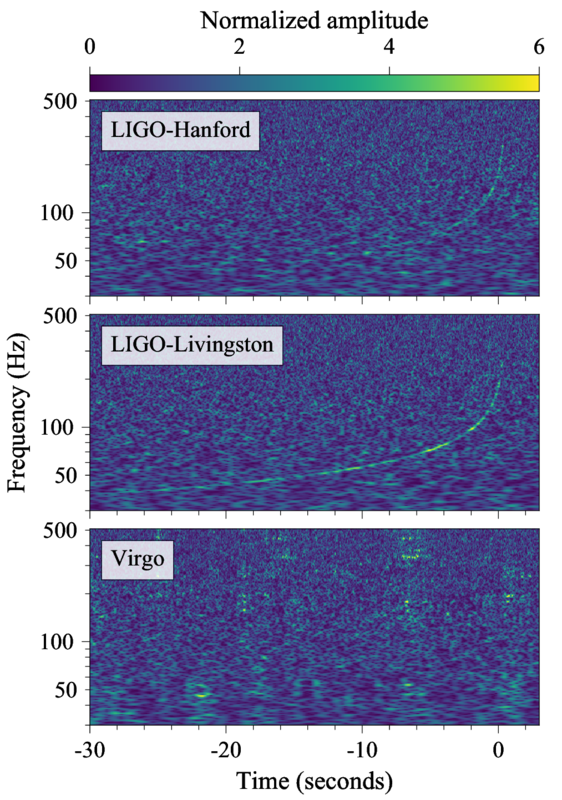 To accompany the detection announcement, the LIGO Scientific & Virgo Collaboration put together a suite of companion papers, each looking at a different aspect of the detection and its implications. Some of the work we wanted to do was not finished at the time of the announcement; in this post I’ll go through the papers we have produced since the announcement. I’ve listed the papers below in an order that makes sense to me when considering them together. Each started off as an investigation to check that we really understood the signal and were confident that the inferences made about the source were correct. We had preliminary results for each at the time of the announcement. Since then, the papers have evolved to fill different niches [bonus points note]. The Event was loud enough to spot by eye after some simple filtering (provided that you knew where to look). You can therefore figure out some things about the source with back-of-the-envelope calculations. In particular, you can convince yourself that the source must be two black holes. This paper explains these calculations at a level suitable for a keen high-school or undergraduate physics student. 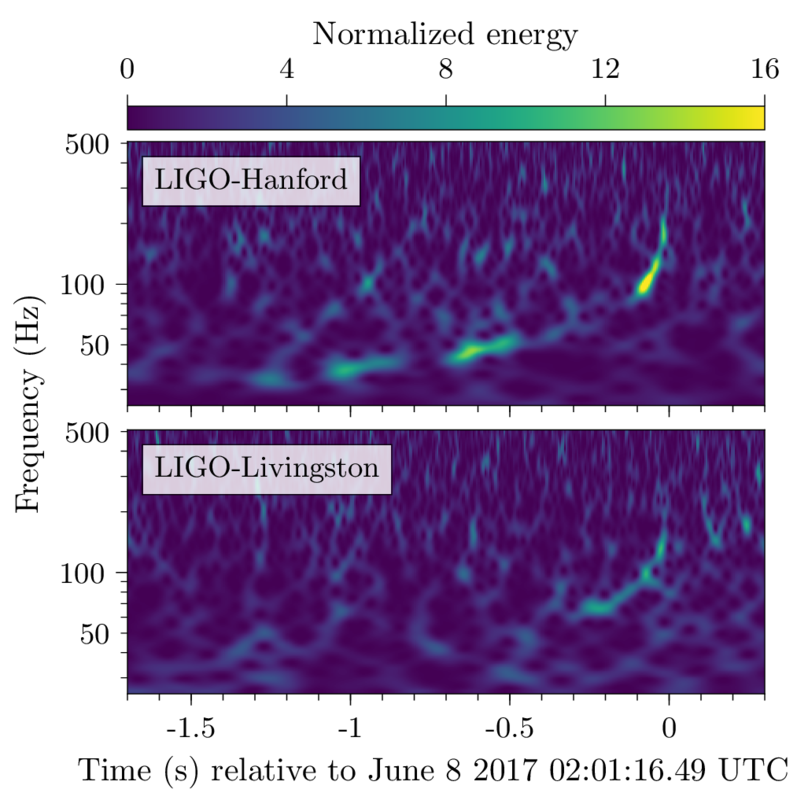 To properly measure the properties of GW150914’s source, you need to compare the data to predicted gravitational-wave signals. In the Parameter Estimation Paper, we did this using two different waveform models. These models include lots of features binary black hole mergers, but not quite everything. In particular, they don’t include all the effects of precession (the wibbling of the orbit because of the black holes spins). In this paper, we analyse the signal using a model that includes all the precession effects. We find results which are consistent with our initial ones. To check how well our waveform models can measure the properties of the source, we repeat the parameter-estimation analysis on some synthetic signals. These fake signals are calculated using numerical relativity, and so should include all the relevant pieces of physics (even those missing from our models). 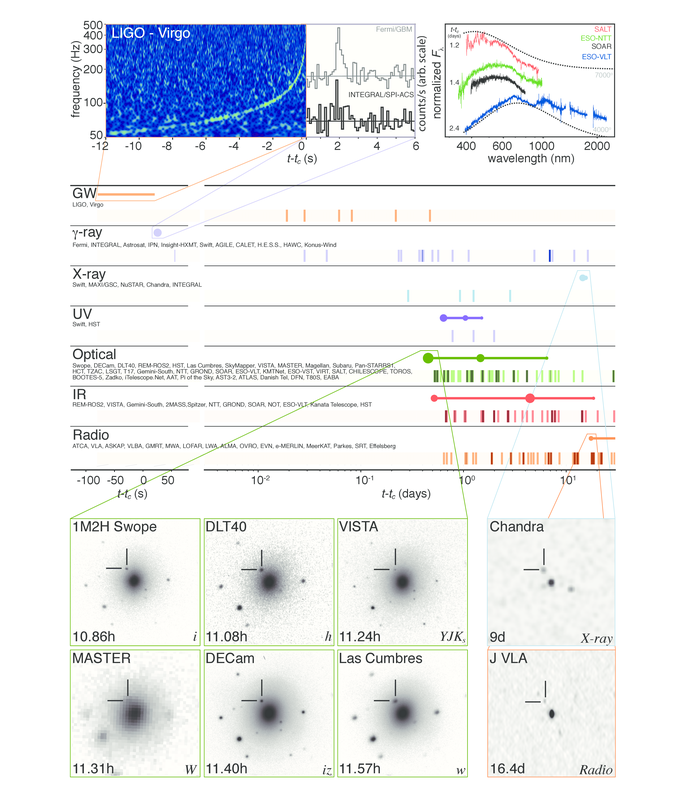 This paper checks to see if there are any systematic errors in results for a signal like GW150914. It looks like we’re OK, but this won’t always be the case. Since GW150914 was so short, we can actually compare the data directly to waveforms calculated using numerical relativity. We only have a handful of numerical relativity simulations, but these are enough to give an estimate of the properties of the source. This paper reports the results of this investigation. Unsurprisingly, given all the other checks we’ve done, we find that the results are consistent with our earlier analysis. If you’re interested in numerical relativity, this paper also gives a nice brief introduction to the field. 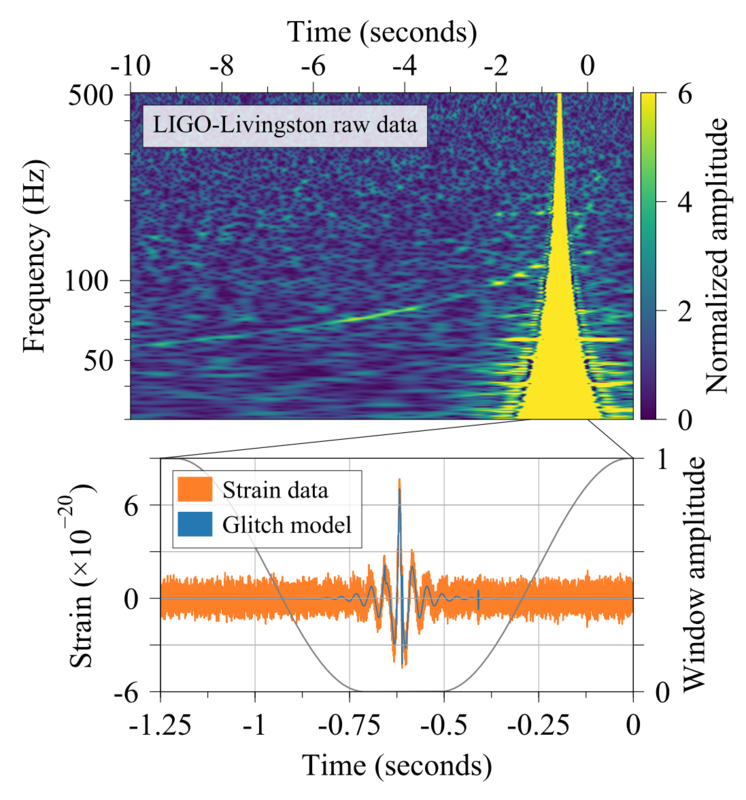 It’s fun to play with LIGO data. The LIGO Open Science Center (LOSC), has put together a selection of tutorials to show you some of the basics of analysing signals. I wouldn’t blame you if you went of to try them now, instead of reading the rest of this post. Even though it would mean that no-one read this sentence. Purple monkey dishwasher. The LOSC tutorials show you how to make your own version of some of the famous plots from the detection announcement. This paper explains how to go from these, using the minimum of theory, to some inferences about the signal’s source: most significantly that it must be the merger of two black holes. GW150914 is a chirp. It sweeps up from low frequency to high. This is what you would expect of a binary system emitting gravitational waves. The gravitational waves carry away energy and angular momentum, causing the binary’s orbit to shrink. This means that the orbital period gets shorter, and the orbital frequency higher. The gravitational wave frequency is twice the orbital frequency (for circular orbits), so this goes up too. Here and are the speed of light and the gravitational constant, which usually pop up in general relativity equations. If you use this formula (perhaps fitting for the trend ) you can get an estimate for the chirp mass. By fiddling with your fit, you’ll see there is some uncertainty, but you should end up with a value around [bonus note]. If we divide the binary separation by the Schwarzschild radius we get the compactness . A compactness of could only happen for black holes. We could maybe get a binary made of two neutron stars to have a compactness of , but the system is too heavy to contain two neutron stars (which have a maximum mass of about ). The system is so compact, it must contain black holes! What I especially like about the compactness is that it is unaffected by cosmological redshifting. The expansion of the Universe will stretch the gravitational wave, such that the frequency gets lower. This impacts our estimates for the true orbital frequency and the masses, but these cancel out in the compactness. There’s no arguing that we have a highly relativistic system. You might now be wondering what if we don’t assume the binary is equal mass (you’ll find it becomes even more compact), or if we factor in black hole spin, or orbital eccentricity, or that the binary will lose mass as the gravitational waves carry away energy? The paper looks at these and shows that there is some wiggle room, but the signal really constrains you to have black holes. This conclusion is almost as inescapable as a black hole itself. There are a few things which annoy me about this paper—I think it could have been more polished; “Virgo” is improperly capitalised on the author line, and some of the figures are needlessly shabby. 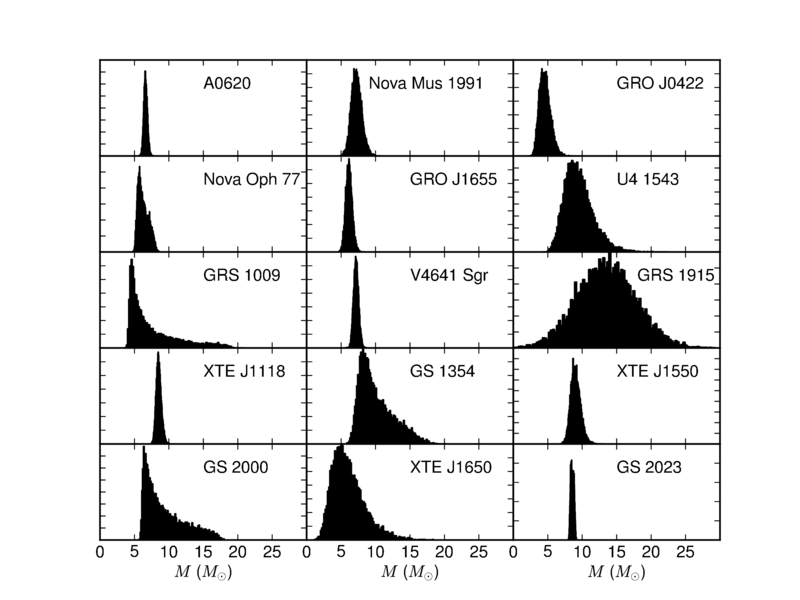 However, I think it is a fantastic idea to put together an introductory paper like this which can be used to show students how you can deduce some properties of GW150914’s source with some simple data analysis. I’m happy to be part of a Collaboration that values communicating our science to all levels of expertise, not just writing papers for specialists! 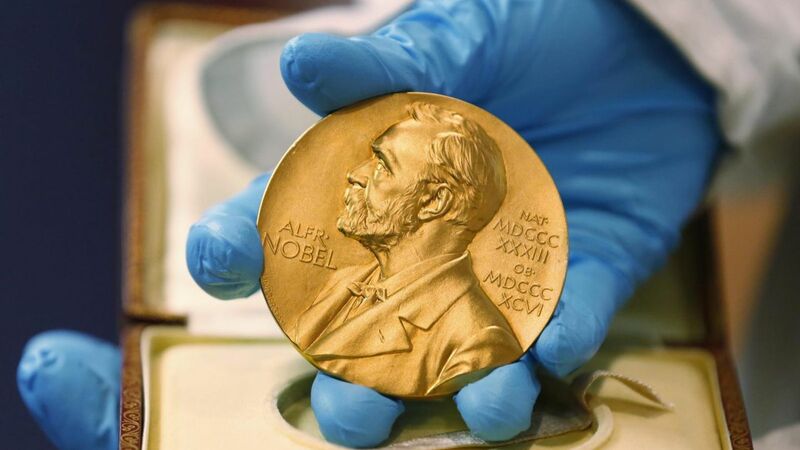 During my undergraduate degree, there was only a single lecture on gravitational waves [bonus note]. I expect the topic will become more popular now. If you’re putting together such a course and are looking for some simple exercises, this paper might come in handy! Or if you’re a student looking for some project work this might be a good starting reference—bonus points if you put together some better looking graphs for your write-up. If this paper has whetted your appetite for understanding how different properties of the source system leave an imprint in the gravitational wave signal, I’d recommend looking at the Parameter Estimation Paper for more. 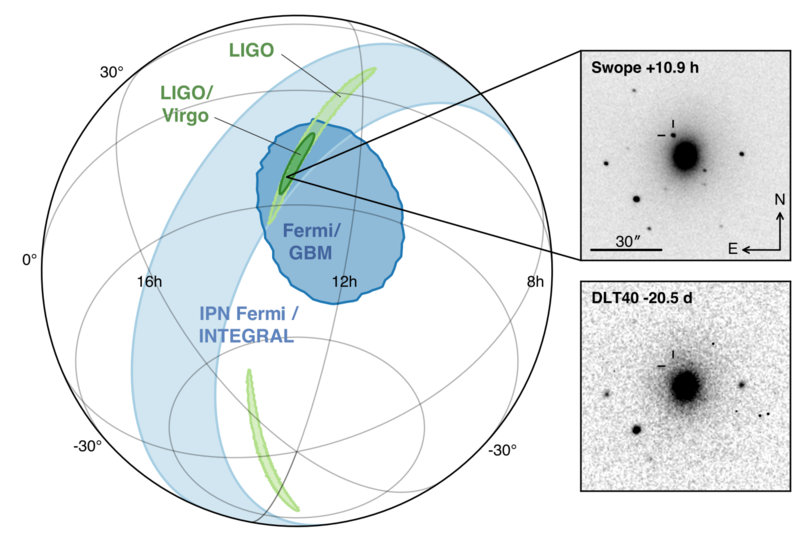 The Basic Physics Paper explained how you could work out some properties of GW150914’s source with simple calculations. These calculations are rather rough, and lead to estimates with large uncertainties. To do things properly, you need templates for the gravitational wave signal. This is what we did in the Parameter Estimation Paper. The first we referred to as EOBNR, short for the lengthy technical name SEOBNRv2_ROM_DoubleSpin. In short: This includes the spins of the two black holes, but assumes they are aligned such that there’s no precession. In detail: The waveform is calculated by using effective-one-body dynamics (EOB), an approximation for the binary’s motion calculated by transforming the relevant equations into those for a single object. The S at the start stands for spin: the waveform includes the effects of both black holes having spins which are aligned (or antialigned) with the orbital angular momentum. Since the spins are aligned, there’s no precession. The EOB waveforms are tweaked (or calibrated, if you prefer) by comparing them to numerical relativity (NR) waveforms, in particular to get the merger and ringdown portions of the waveform right. While it is easier to solve the EOB equations than full NR simulations, they still take a while. To speed things up, we use a reduced-order model (ROM), a surrogate model constructed to match the waveforms, so we can go straight from system parameters to the waveform, skipping calculating the dynamics of the binary. The second we refer to as IMRPhenom, short for the technical IMRPhenomPv2. In short: This waveform includes the effects of precession using a simple approximation that captures the most important effects. In detail: The IMR stands for inspiral–merger–ringdown, the three phases of the waveform (which are included in in the EOBNR model too). Phenom is short for phenomenological: the waveform model is constructed by tuning some (arbitrary, but cunningly chosen) functions to match waveforms calculated using a mix of EOB, NR and post-Newtonian theory. This is done for black holes with (anti)aligned spins to first produce the IMRPhenomD model. This is then twisted up, to include the dominant effects of precession to make IMRPhenomPv2. This bit is done by combining the two spins together to create a single parameter, which we call , which determines the amount of precession. Since we are combining the two spins into one number, we lose a bit of the richness of the full dynamics, but we get the main part. In this paper, we use another waveform model, a precessing EOBNR waveform, technically known as SEOBNRv3. This model includes all the effects of precession, not just the simple model of the IMRPhenom model. However, it is also computationally expensive, meaning that the analysis takes a long time (we don’t have a ROM to speed things up, as we do for the other EOBNR waveform)—each waveform takes over 20 times as long to calculate as the IMRPhenom model [bonus note]. Our results show that all three waveforms give similar results. The precessing EOBNR results are generally more like the IMRPhenom results than the non-precessing EOBNR results are. The plot below compares results from the different waveforms [bonus note]. 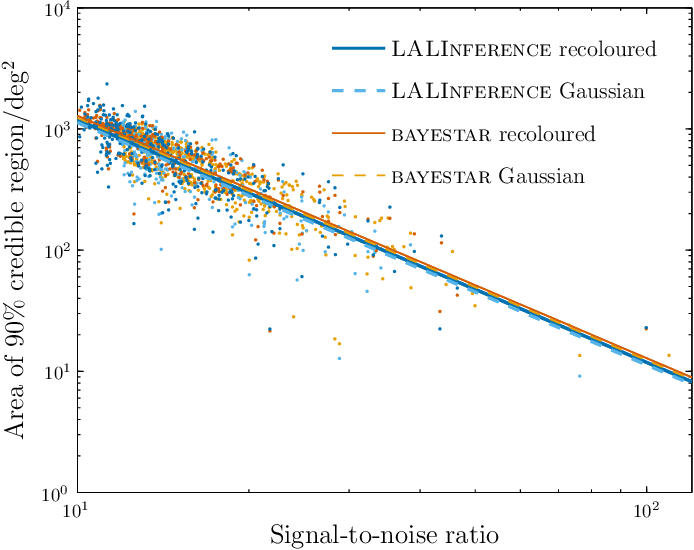 Comparison of parameter estimates for GW150914 using different waveform models. The bars show the 90% credible intervals, the dark bars show the uncertainty on the 5%, 50% and 95% quantiles from the finite number of posterior samples. The top bar is for the non-precessing EOBNR model, the middle is for the precessing IMRPhenom model, and the bottom is for the fully precessing EOBNR model. Figure 1 of the Precession Paper; see Figure 9 for a comparison of averaged EOBNR and IMRPhenom results, which we have used for our overall results. We had used the difference between the EOBNR and IMRPhenom results to estimate potential systematic error from waveform modelling. Since the two precessing models are generally in better agreement, we have may have been too pessimistic here. The main difference in results is that our new refined analysis gives tighter constraints on the spins. From the plot above you can see that the uncertainty for the spin magnitudes of the heavier black hole , the lighter black hole and the final black hole (resulting from the coalescence) , are slightly narrower. This makes sense, as including the extra imprint from the full effects of precession gives us a bit more information about the spins. The plots below show the constraints on the spins from the two precessing waveforms: the distributions are more condensed with the new results. Comparison of orientations and magnitudes of the two component spins. The spin is perfectly aligned with the orbital angular momentum if the angle is 0. The left disk shows results using the precessing IMRPhenom model, the right using the precessing EOBNR model. In each, the distribution for the more massive black hole is on the left, and for the smaller black hole on the right. Adapted from Figure 5 of the Parameter Estimation Paper and Figure 4 of the Precession Paper. In conclusion, this analysis had shown that included the full effects of precession do give slightly better estimates of the black hole spins. However, it is safe to trust the IMRPhenom results. 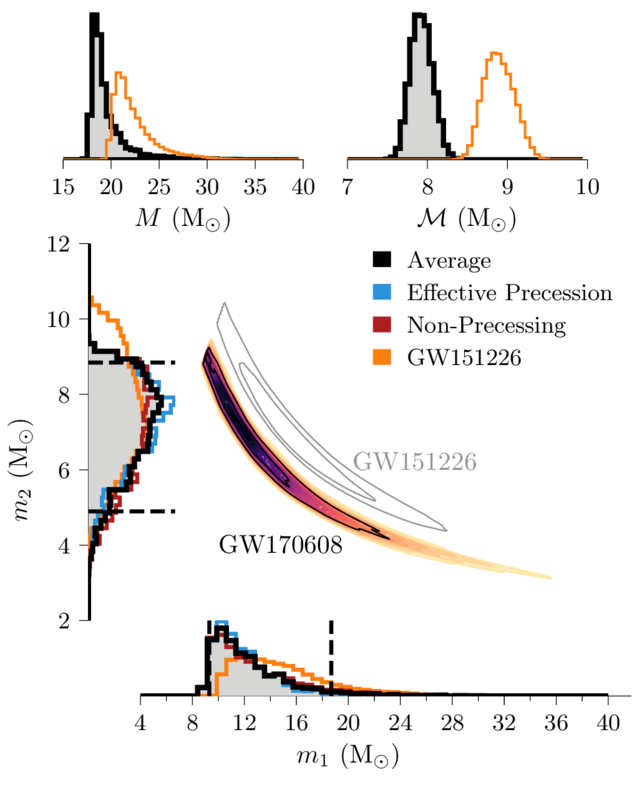 If you are looking for the best parameter estimates for GW150914, these results are better than the original results in the Parameter Estimation Paper. However, the O2 Catalogue Paper includes results using improved calibration and noise power spectral density estimation, as well as using precessing waveforms! The Precession Paper highlighted how important it is to have good waveform templates. If there is an error in our templates, either because of modelling or because we are missing some physics, then our estimated parameters could be wrong—we would have a source of systematic error. We know our waveform models aren’t perfect, so there must be some systematic error, the question is how much? From our analysis so far (such as the good agreement between different waveforms in the Precession Paper), we think that systematic error is less significant than the statistical uncertainty which is a consequence of noise in the detectors. 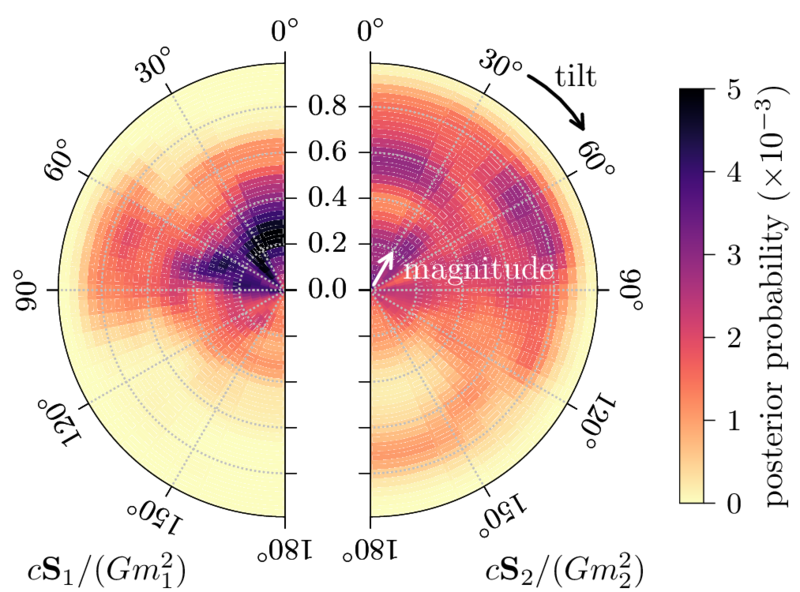 In this paper, we try to quantify systematic error for GW150914-like systems. To asses systematic errors, we analyse waveforms calculated by numerical relativity simulations into data around the time of GW150914. Numerical relativity exactly solves Einstein’s field equations (which govern general relativity), so results of these simulations give the most accurate predictions for the form of gravitational waves. As we know the true parameters for the injected waveforms, we can compare these to the results of our parameter estimation analysis to check for biases. We use waveforms computed by two different codes: the Spectral Einstein Code (SpEC) and the Bifunctional Adaptive Mesh (BAM) code. (Don’t the names make them sound like such fun?) Most waveforms are injected into noise-free data, so that we know that any offset in estimated parameters is dues to the waveforms and not detector noise; however, we also tried a few injections into real data from around the time of GW150914. The signals are analysed using our standard set-up as used in the Parameter Estimation Paper (a couple of injections are also included in the Precession Paper, where they are analysed with the fully precessing EOBNR waveform to illustrate its accuracy). The results show that in most cases, systematic errors from our waveform models are small. However, systematic errors can be significant for some orientations of precessing binaries. If we are looking at the orbital plane edge on, then there can be errors in the distance, the mass ratio and the spins, as illustrated below [bonus note]. Thankfully, edge-on binaries are quieter than face-on binaries, and so should make up only a small fraction of detected sources (GW150914 is most probably face off). Furthermore, biases are only significant for some polarization angles (an angle which describes the orientation of the detectors relative to the stretch/squash of the gravitational wave polarizations). Factoring this in, a rough estimate is that about 0.3% of detected signals would fall into the unlucky region where waveform biases are important. Parameter estimation results for two different GW150914-like numerical relativity waveforms for different inclinations and polarization angles. An inclination of means the binary is face on, means it face off, and an inclination around is edge on. The bands show the recovered 90% credible interval; the dark lines the median values, and the dotted lines show the true values. The (grey) polarization angle was chosen so that the detectors are approximately insensitive to the polarization. Figure 4 of the Systematics Paper. While it seems that we don’t have to worry about waveform error for GW150914, this doesn’t mean we can relax. Other systems may show up different aspects of waveform models. For example, our approximants only include the dominant modes (spherical harmonic decompositions of the gravitational waves). Higher-order modes have more of an impact in systems where the two black holes are unequal masses, or where the binary has a higher total mass, so that the merger and ringdown parts of the waveform are more important. We need to continue work on developing improved waveform models (or at least, including our uncertainty about them in our analysis), and remember to check for biases in our results! In the Precession Paper we discussed how important it was to have accurate waveforms; in the Systematics Paper we analysed numerical relativity waveforms to check the accuracy of our results. Since we do have numerical relativity waveforms, you might be wondering why we don’t just use these in our analysis? In this paper, we give it a go. Our standard parameter-estimation code (LALInference) randomly hops around parameter space, for each set of parameters we generate a new waveform and see how this matches the data. This is an efficient way of exploring the parameter space. Numerical relativity waveforms are too computationally expensive to generate one each time we hop. We need a different approach. The alternative, is to use existing waveforms, and see how each of them match. Each simulation gives the gravitational waves for a particular mass ratio and combination of spins, we can scale the waves to examine different total masses, and it is easy to consider what the waves would look like if measured at a different position (distance, inclination or sky location). Therefore, we can actually cover a fair range of possible parameters with a given set of simulations. To keep things quick, the code averages over positions, this means we don’t currently get an estimate on the redshift, and so all the masses are given as measured in the detector frame and not as the intrinsic masses of the source. The number of numerical relativity simulations is still quite sparse, so to get nice credible regions, a simple Gaussian fit is used for the likelihood. I’m not convinced that this capture all the detail of the true likelihood, but it should suffice for a broad estimate of the width of the distributions. The results of this analysis generally agree with those from our standard analysis. This is a relief, but not surprising given all the other checks that we have done! It hints that we might be able to get slightly better measurements of the spins and mass ratios if we used more accurate waveforms in our standard analysis, but the overall conclusions are sound. I’ve been asked if since these results use numerical relativity waveforms, they are the best to use? My answer is no. As well as potential error from the sparse sampling of simulations, there are several small things to be wary of. We only have short numerical relativity waveforms. This means that the analysis only goes down to a frequency of and ignores earlier cycles. The standard analysis includes data down to , and this extra data does give you a little information about precession. (The limit of the simulation length also means you shouldn’t expect this type of analysis for the longer LVT151012 or GW151226 any time soon). This analysis doesn’t include the effects of calibration uncertainty. There is some uncertainty in how to convert from the measured signal at the detectors’ output to the physical strain of the gravitational wave. Our standard analysis fold this in, but that isn’t done here. The estimates of the spin can be affected by miscalibration. (This paper also uses the earlier calibration, rather than the improved calibration of the O1 Binary Black Hole Paper). Despite numerical relativity simulations producing waveforms which include all higher modes, not all of them are actually used in the analysis. More are included than in the standard analysis, so this will probably make negligible difference. The noise PSD varies all the time, so it needs to be estimated from the data. If you use a different stretch of data, you’ll get a different estimate, and this will impact your results. Ideally, you would want to estimate from the time span that includes the signal itself, but that’s tricky as there’s a signal in the way. The analysis in this paper calculates the noise power spectral density using a different time span and a different method than our standard analysis; therefore, we expect some small difference in the estimated parameters. This might be comparable to (or even bigger than) the difference from switching waveforms! We see from the similarity of results that this cannot be a big effect, but it means that you shouldn’t obsess over small differences, thinking that they could be due to waveform differences, when they could just come from estimation of the noise PSD. Lots of work is currently going into making sure that the numerator term is accurate. I think that the denominator needs attention too. Since we have been kept rather busy, including uncertainty in PSD estimation will have to wait for a future set papers. 100 bonus points to anyone who folds up the papers to make beaks suitable for eating different foods. 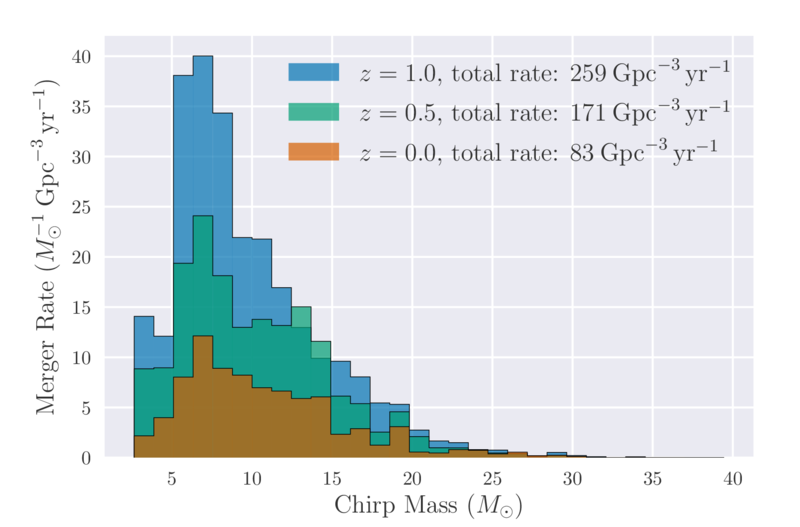 Our current best estimate for the chirp mass (from the O2 Catalogue Paper) would be . You need proper templates for the gravitational wave signal to calculate this. If you factor in the the gravitational wave gets redshifted (shifted to lower frequency by the expansion of the Universe), then the true chirp mass of the source system is . My one undergraduate lecture on gravitational waves was the penultimate lecture of the fourth-year general relativity course. I missed this lecture, as I had a PhD interview (at the University of Birmingham). Perhaps if I had sat through it, my research career would have been different? The computational expense of a waveform is important, as when we are doing parameter estimation, we calculate lots (tens of millions) of waveforms for different parameters to see how they match the data. Before O1, the task of using SEOBNRv3 for parameter estimation seemed quixotic. The first detection, however, was enticing enough to give it a try. It was a truly heroic effort by Vivien Raymond and team that produced these results—I am slightly suspicious the Vivien might actually be a wizard. GW150914 is a short signal, meaning it is relatively quick to analyse. Still, it required us using all the tricks at our disposal to get results in a reasonable time. When it came time to submit final results for the Discovery Paper, we had just about 1,000 samples from the posterior probability distribution for the precessing EOBNR waveform. For comparison, we had over 45,000 sample for the non-precessing EOBNR waveform. 1,000 samples isn’t enough to accurately map out the probability distributions, so we decided to wait and collect more samples. The preliminary results showed that things looked similar, so there wouldn’t be a big difference in the science we could do. For the Precession Paper, we finally collected 2,700 samples. This is still a relatively small number, so we carefully checked the uncertainty in our results due to the finite number of samples. The Precession Paper has shown that it is possible to use the precessing EOBNR for parameter estimation, but don’t expect it to become the norm, at least until we have a faster implementation of it. Vivien is only human, and I’m sure his family would like to see him occasionally. —the mass ratio, . Confusingly, numerical relativists often use the opposite convention (which is why the Numerical Relativity Comparison Paper discusses results in terms of : we can keep the standard definition, but all the numbers are numerical relativist friendly). —the inclination, the angle between the line of sight and the orbital angular momentum ( ). This is zero for a face-on binary. —the angle between the line of sight ( ) and the total angular momentum of the binary ( ); this is approximately equal to the inclination, but is easier to use for precessing binaries. —the primary tilt angle, the angle between the orbital angular momentum and the heavier black holes spin ( ). This is zero for aligned spin. —the secondary tilt angle, the angle between the orbital angular momentum and the lighter black holes spin ( ). —the angle between the projections of the two spins on the orbital plane. —the polarization angle, this is zero when the detector arms are parallel to the polarization’s stretch/squash axis. For more detailed definitions, check out the Parameter Estimation Paper or the LALInference Paper.